From the home screen itself you can start the backup of your hard drive's partition or the whole hard drive, the OS along with it. The software is a little heavy at 200+ MB but the installation is simple. Just click on the Backup button present on the home screen and a wizard will open up to guide you through the process. Select the drives you want to back up and the destination drive. There are a few settings regarding the backup which you decide to customize or leave it in default state. One option you might like to customize here is the option to break the files into 4,000MB each if you don't want to do that. You can save your backup practically anywhere it fits. You can save it on a external hard drive, DVD, USB or even on the same hard drive. You can backup the data manually or schedule it to happen on a daily, weekly or monthly basis. 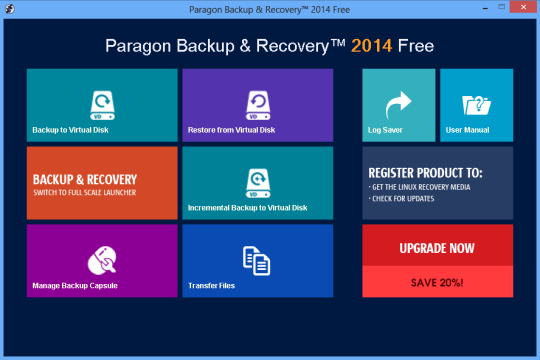 Paragon Backup Home 14 is smart enough to not backup unless files like cache or the hibernation data. Since the backup is created as a disk image, you need to boot into the storage device to start the restore process. Once you have booted into the storage media you will be able to restore everything as it was before- the OS, all folders and files. The restoration process is completely automated and will take some time depending on the size of your backup. You can extract files from the backup. Individual files can be extracted from the disk image stored on the storage media and you can also copy from one place to another through the software. You can create a Backup Capsule, which is actually a secured drive where your backup will reside. As no software except Paragon can access it, it is safe from any virus or malware infection. You will get proper support only if you are a paid user. Not that free users don't get any support but priority is given to paid users.